This Thursday, at 7pm at the Bishop O'Connor Center in Madison, WI, Bishop Robert C. Morlino will be celebrating a pontifical Mass at the throne, followed by a Eucharistic procession. All those in the southern Wisconsin area are cordially invited to attend, and seminarians and clergy are welcome to sit in choir (though please email me first so we have space). Priests and seminarians from around the diocese will be assisting. 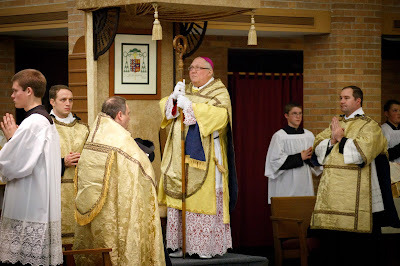 If you have not assisted at a pontifical Mass before, and you are within driving distance of Madison, I would highly encourage you to. It is a very beautiful ceremony, the fullness of the Roman Rite.